You Won’t Be Able To Take Your Eyes Off Sonam’s Stunning Outfit! Sonam Kapoor’s got sass and there’s no one quite like her. The actress walked the ramp for Ralph & Russo in a beautiful bridal gown at Paris Fashion Week yesterday and she did it like a queen! The gown was a show-stopping creation from the brand’s Fall-Winter Haute Couture ’17/ 18 collection and it was all parts drama, flare and royalty! We loved the white peplum gown with embellishments all-over! The long trail and the sheer veil made Sonam look like a Goddess and we just weren’t able to take our eyes off her even for a second. It was the first time an Indian celebrity was walking the ramp for an International designer, that too in Paris. 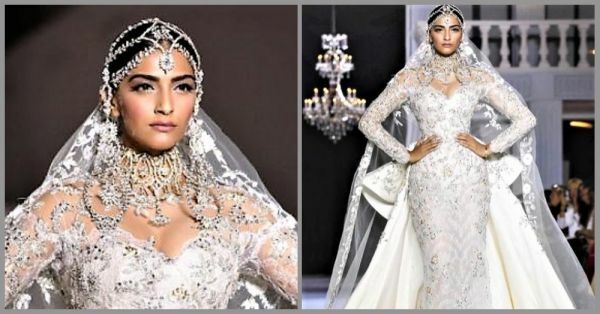 With minimal makeup, Sonam wore a diamond headgear with exaggerated earrings and looked nothing less than a dream and made fashion history right there! We loved the notable collaboration between the two when Sonam was seen promoting Ralph & Russo at Cannes last year as well. And here we see it again - isn’t it just amazing?! So what did you think about this stunning masterpiece by Ralph & Russo?